Is your property worth less than your mortgage? This scenario can create significant financial problems and often affects those with investment properties. However, with the right professional assistance, it needn’t necessarily result in bankruptcy. Here, we outline the three steps you can take to deal with a potential mortgage shortfall. Your property is worth less than your mortgage: how can it happen? In the past we have assisted a number of people who have owned properties (often investment properties) which are worth less than the mortgage on them. Going back a few years, it was mainly owners of properties in mining towns or remote areas who we were asked to help, as there has been a significant decrease in the value of these assets over the last five years or so. However, an increased supply of new apartments recently, together with tougher lending rules being applied by banks and rising interest rates has led to a decline in property prices in a number of areas. This sometimes results in properties being worth less than the loans that are secured over them. If you do own a property worth less than the mortgage, keeping it and paying secured loans can be difficult. It can even result in the property being repossessed by the bank and bankruptcy for the owner. If you are in this position, don’t blame yourself but be proactive and explore the solutions. Along with the right professional help, the following three-step process may achieve a better outcome for both you and your bank. 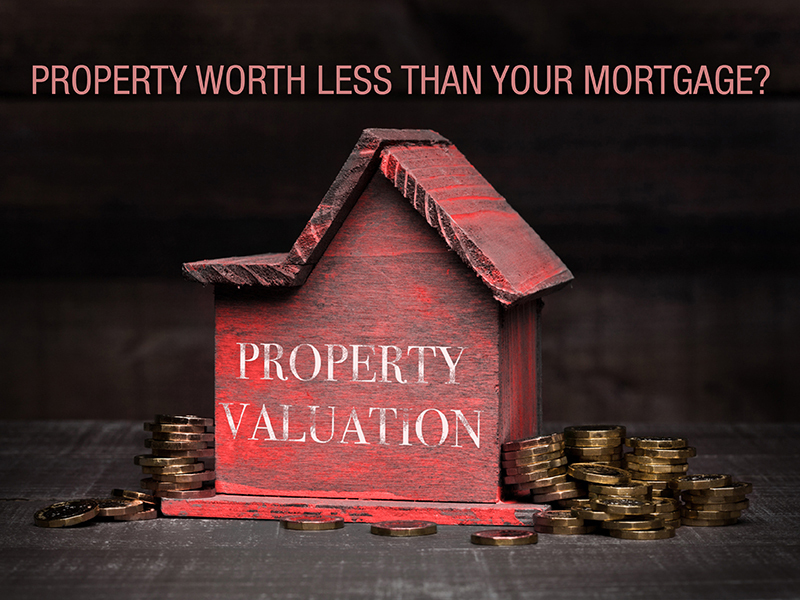 Get an appraisal of the value of the property and compare the appraisal to debts secured over it. If there is a significant shortfall, this might be a reason to sell. Work out the property holding costs such as interest, rates, insurance, property agent fees, etc. Then decide if (and for how long) you can afford to continue paying property holding costs, measuring the available funds against any rent being received. If you cannot keep paying the property holding costs, this might be a reason to sell. Consider whether the market for properties in the area may improve. If not, this might be a reason to sell. Based on the above and other factors, you need to decide whether you can hold the property for long enough to break even and if it is worth doing this if it will take a long time. Speak to the bank and advise them what’s happening: that you intend to sell the property and that there will be a shortfall on the sale. An alternative to this is to hand the keys to the property back to the bank so that they can sell the property; but the bank may appreciate you selling it yourself, so they do not have to be involved. Appoint and liaise with a real estate agent and understand that, once an agent is appointed, the sale may take some time. If, during the sale process, you are unable to continue making mortgage repayments, discuss possible hardship options available with the bank. If offers are received, refer them to the bank. While the bank may not necessarily approve you accepting an offer, they will advise if they have any objection to it. At every stage of this process, keep the bank up to date with the progress of the sale. Once an acceptable offer is received, sell the property. Engage a solicitor to arrange the sale and settlement and have the bank release its mortgage at settlement. It may be best to get the bank to agree to legal costs being paid at settlement prior to any solicitor being engaged. With average creditor returns in bankruptcy less than four cents per dollar, banks know they’re likely to receive a very limited return if you go bankrupt. They also know that they’ll incur $10,000 or more in legal costs to obtain a judgment against you and then make you bankrupt. Therefore, banks are generally open to negotiations to settle shortfall loan debts. The customer avoids bankruptcy and the bank receives a better return. Formulating a proposal to settle the bank’s debt . Negotiating further with the bank with the aim of avoiding bankruptcy. Any arrangements agreed with a bank need to be properly documented before you hand over any money. Such arrangements will provide for full and final settlement of the bank’s debt so they have no further claim against you. Need assistance right now with settling a mortgage debt? If you’re having problems right now with formulating a proposal to settle the bank’s debt or negotiating with the bank to avoid bankruptcy, we may be able to help. The first step to solve your problems is to simply get in contact with us for a free, no obligation discussion.